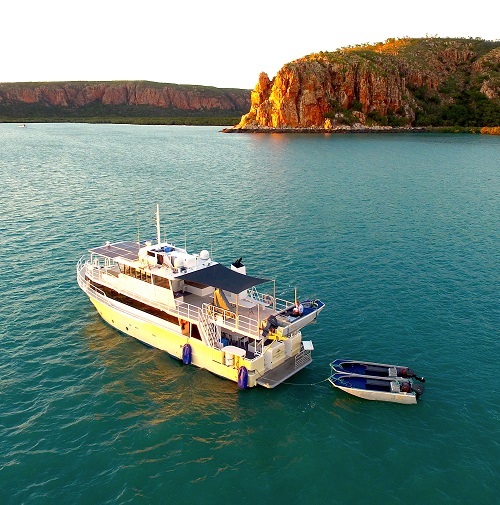 The Kimberley Pearl is a beautifully restored and refurbished pearling vessel, now cruising the Kimberley Coast. Our Pearl of the Kimberley! Formerly a vessel of the famed Paspaley Pearls modern pearl lugger fleet. Registered as B57, the Dalumba, as she was named, worked the pearl shell grounds off Eighty Mile Beach and at Compass Rose. Teams of six divers would drift across the shell beds, collecting pinctada Maxima for the purposes of surface cultivated Australian South Sea pearl farming. The region where your cruising takes place is ideal for growing out the cultured pearl. The Dalumba would transport seeded shell to Kuri Bay or Talbot bay where they remain for 2 years to grow before returning to be harvested by pearl technicians. Guests enjoy fine food sourced from the bountiful waters of the Kimberley, matched by glorious sunrises and sunsets. You're the main act, backed by rugged coastal cliffs, hidden rainforest and thick mangrove shorelines. Sit back and relax or take up one of the many activities available aboard or onshore. The crew will provide an array of fishing equipment and fishing advice, and you can choose to fish hidden lumps or the many tributaries emptying into bays. Our three tenders (dinghies) will ferry guests ashore where you can explore the waterways, hillsides and coastal fringes. We advise guests to stay alert in these waters as the crocodiles are watching our every move. Our staff are ready to make your journey a reality, by making your booking as detailed as you would like.